Product prices and availability are accurate as of 2019-04-24 03:08:13 EDT and are subject to change. Any price and availability information displayed on http://www.amazon.com/ at the time of purchase will apply to the purchase of this product. Have you ever let your favorite cut of meat or poultry soak for hours only to find the center as edible and satisfying as a piece of cardboard? Everyone who enjoys home cooking and grilling has been there. It's not a pleasant experience. Quick Grill's meat injector ensures you never have to settle for dry or bland food. Nor do you have to wait hours for little more than surface flavoring. With a practical and functional design, the Quick Grill Injector penetrates deep to deliver optimum flavor infusion throughout. Use minced garlic or onions, oil infused herbs, butter, bbq marinades, etc to achieve gourmet flavors sure to impress your family and friends. 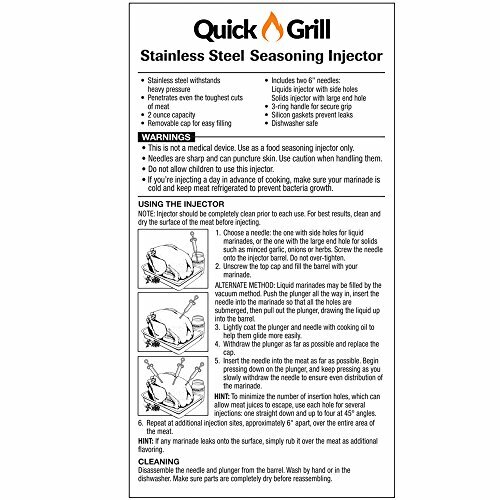 This seasoning injector by Quick Grill is great for working in the kitchen or outside on the bbq. The easy to use and easy to clean design is dishwasher safe and built to last. Instructions included. There's no way you can lose. With a 100% money-back guarantee on the Quick Grill Injector, you risk nothing. If you're not absolutely thrilled with your order, we'll gladly refund your money or replace your marinade injector kit---whichever you prefer. No questions asked. 2 Oz capacity seasoning injector designed with the highest food grade stainless steel suitable to withstand heavy pressure. 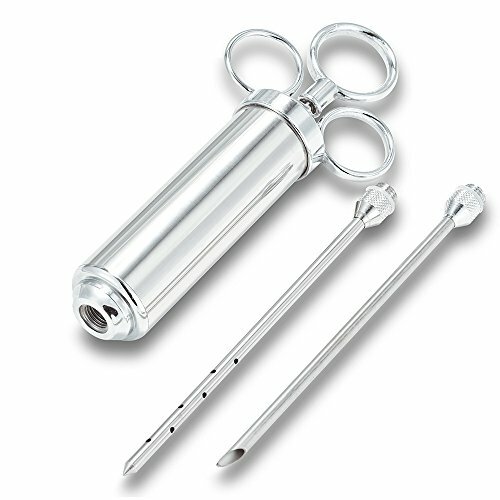 Includes 1 needle with side holes for liquid marinades and 1 needle with large end hole for minced garlic, onion and other solids. 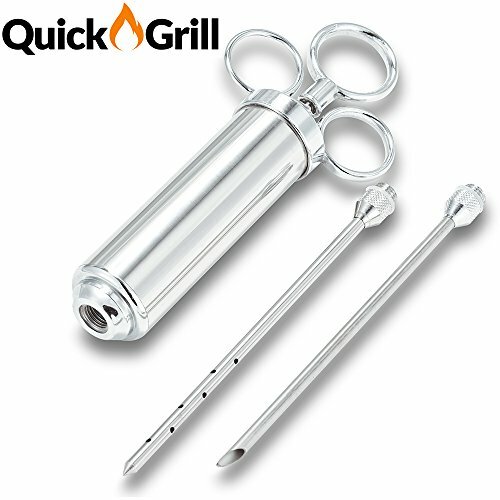 The Quick Grill meat injector is perfect for intensifying the flavor of brisket, pork, chicken, turkey, lamb, goose, duck, and more! 3-Hole hand grip design for easy and safe use. Food grade silicon gaskets prevent leaks and waste. Durable and sharp, the needles puncture any meat or poultry with ease, ensuring you can enrich the taste of tough or thick cuts A 2-ounce barrel minimizes refills, a sturdy marinade injector plunger offers improved pressure control, and a three-ring handle gives you a better grip for optimum comfort. Removable lid for easy fill and clean. Dishwasher safe. Penetrates even the toughest cuts of meat creating rich and flavorful roasts, turkeys, briskets, chicken and pork. A 100% Money-Back Guarantee and Lifetime Warranty eliminate all risk so you can use the Quick Grill marinade injector kit with confidence! Your complete satisfaction is assured.